So I've had a some d44's swapped in for a few years now and am running 37s. Because of where my hangers are, I'm running some suburban leaf springs up front. Now, they are working fantastic and all, but I had to put a fairly large relocation plate on them to fit my 37s in there, and I don't like the look of them anymore. The pin location on a set of rear 1989-1994 Toyota pickup leaf springs fits what I need perfectly, but I have no idea if they will support the weight of my truck or not. 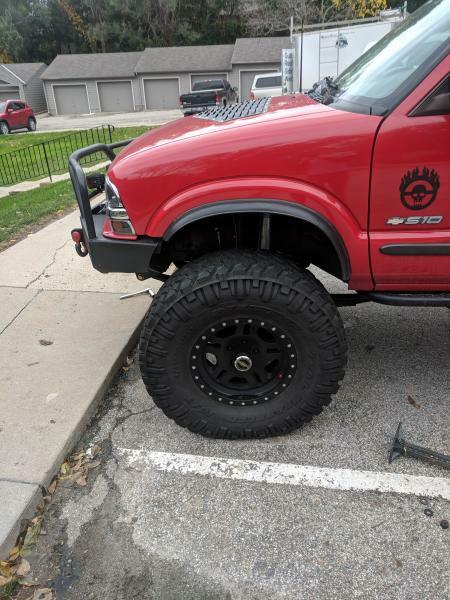 My other option is running a set of 1986-1996 Dodge dakota springs up there, which would give me a very nice shackle angle and should support the weight of my front+winch bumper, but the pin location is pushing it on where my tires might rub the fender when they get crammed. So the question is if anyone is running Toyota springs up front? Truck is in the shop right now so I'm limited on the pictures. I don't have any answers but I'm going to move this to the SAS swap section with a reroute here in the suspension section. This way hopefully it'll have a better chance of getting the attention of someone that can help. I’m not sure as to if they will hold up to the weight of the truck. But on mine, I had a pair of main leaves built to put my axle right where I wanted it. Bolted to the rest of wagoneer spring packs. Something else you could try, if the center pins are the same size, swap the main leaves onto your existing pack and see how it is. Sometimes you have to experiment a little. Sorry for resurrecting this, it's been a long and ****** winter here in Nebraska. I've decided I'm going to be going with the Toyota leaf springs with some add-a-leafs. This should be enough to keep it arched a little and not be completely flat. Looking to get a little bit of lift here, maybe about 2 inches, otherwise I'll just fab up some longer shackles.